Cyberghost VPN service helps you in creating virtual network connection when you are using the Internet so that no website can interfere in what you are doing, and no other person will be able to get your personal information. Cyberghost VPN lets you surf the internet freely by maintaining your privacy and provides you freedom to use Internet anywhere by acting as a firewall and hides your IP address as well. This service is a quick source of getting rid of hackers and you can get its free version from different websites. As other services, Cyberghost VPN also has a premium version which provides you more excellent features to enjoy. You can install and use this service easily. First, your username and password is created and after that your system is rebooted for the completion of installation process. Cyberghost VPN software is designed in such a way that its main screen shows some programs like anti-viruses and firewalls and on the left hand side, a user can see several types of options to run the program. The best thing Cyber VPN performs for maintaining your IP address privacy is that it replaces your original IP address with a Cyber VPN IP address. Only this address is shared with other users. The device shows you as an anonymous online and you can use the Internet freely without the fear of leaking out of your personal information. 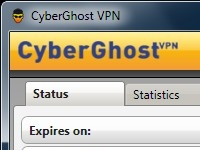 Free version of Cyberghost VPN, on the other hands has some limitations too. The first one is that this version only works for six hours at a time and protects only 1 GB of useful data at a time and after that, you get disconnected from the server. Well! If you want more downloading amount and more uninterrupted time, then you must go for the premium version as it provides you better feature but costs 4 to 10 Euros monthly. Free version of Cyberghost VPN is only suitable for people who want to use Internet for a short period of time on a particular hotspot and premium version can be used for professional purposes, which has to be bought.You may also visit our post why VPN reviews are important.